The Visual Science Lab / Kirk Tuck: Sony exercises their right to build a crappy camera. Sony exercises their right to build a crappy camera. I wrote about this camera two weeks ago and said we should wait and see what it's all about before we pass judgement. It might be a surprisingly good product. That was two weeks ago. When I was in Berlin we took a side trip to one of the biggest trade shows in the world, the IFA show. We were guests of Samsung but I still shoot most of my professional work with Sony cameras like the a99 and the a850 and I was naturally curious about the new camera from Sony. I trudged from one corner of the show to the opposite corner of the show (It's spread out among 27 large exhibition halls) just to see if I could handle and play with the new Sony a3000 mirror less camera and it's familiar kit lens. I slid through a throng of people who seemed captivated by the latest TVs and cellphones and finally found the small area dedicated to cameras. There were few people around the camera area so I was able to walk right up and handle a camera that, while tethered to the display table by a security cord, was accessible and possessed of a fully charged battery. I looked through the EVF, adjusted the diopter and cringed. Now I know why people who have not seen better quality EVFs hold the experience of looking through cheap and nasty ones in such disregard. I could view well enough for composition but there would be no way to judge fine points of focus and no way at all to judge image color or contrast. I instantly came to think of this EVF as a targeting device only. I didn't have much more happiness from the screen on the back. I'd forgotten how primitive a screen could be after three or four years of looking at 1.44 and 2.44 megapixel OLED screens. After I got over my first impressions of the two screens I kept reminding myself that I was not in the target market for this camera. I remembered having written that even if the screens were inadequate for some tasks that perhaps the camera was redeemable by virtue of a stellar sensor. We'll have to wait a bit to test one and see. But then came the final blow that had me getting the camera out of my hands just as quickly as I could...I had actuated the shutter release several times and the tinny clacking noise was so jarring and high pitched that I felt a little bit of my photographic interest/spirit in general being sucked away from me every time I heard it. Again, the sensor may redeem the camera. The lens (I've owned two) is very decent, especially with the right sensor. But the camera has so many strikes against it both visually (the screens) and aurally (the obnoxious shutter noise) that I found myself not really caring about any of the other parameters. Who the camera is for, exactly, is an interesting question. But I can answer with this: It's not aimed at anyone who truly enjoys working with cameras and making great photographs. This is a camera to shoot with only when all of your backups have died and you must get a shot to go on living. Meanwhile whenever I get a chance I use my perfectly silent, solidly built Nikon V1 with its excellent EVF. And the 10MP 1" Aptina sensor works quite well enough, thank you! How strange that Sony decided to under-specify the Alpha 3000 in such a way, I don't think the 16MP APS-C sensor can redeem it, however good it can be. I don't get the hoopla and fixation with EVFs. I've tried EVFs on the various brands, including the Sony, Olympus and Fuji (I visit B&H, Adorama and a number of pro shops in NYC, all stocked with (expensive) toys--eh, equipment--lucky me!). Compared to a decent optical viewfinder like a glass pentaprism on a DSLR, Leica rangefinder or even the clip-on Olympus VF-1, using an EVF is like watching TV or a video game instead of photographing. It feels even more removed from reality and the surroundings than simply putting one's eye(s) to a camera. But maybe it's just me. As to the A3000, the things you hate--the clacking noise, the lo-fi EVF that can't be used for focus confirmation--that's the enthusiast complaining. Most, if not all, soccer moms/dads/vacationers will never manual focus anything and instead rely on the camera AF. And most WANT to hear some sort of shutter sound, fake or otherwise, to confirm the photo--exhibit 1 being the iphone and all other cellphone cameras. If you really want proof, I was at the beach 2 weeks ago and a couple broke out their big, expensive Canon DSLR (bigger DSLR is more expensive as you know) to photograph their newborn baby. Despite the beautiful optical viewfinder and blinding sun, all photos were composed and taken via the LCD/live-view/dirty diaper method (yeah, and my wife quietly told me to stop gawking). And did they even use manual focus? Of course NOT! I wanted to say something helpful, but who am I to interrupt their good time at the beach? My point is that at $400 FREAKIN' DOLLARS with lens (LESS than a very nice dinner in NYC), the A3000 is directly aimed at this type of users, and is the gateway to other Sony goodies should they want a more sophisticated, better specified camera (there's a whole Sony line, after all, in A and E mounts, with very fine Zeiss glass too). They ain't perfect, but maybe Sony ain't so dumb after all. People also eat at McDonalds. i had seen the rearview photo of the camera, and the evf opening looked tiny. i was immediately over it. i had considered getting one for my niece, but even her 13yo self has a fit when she gets stuck with a small viewfinder now. spoiled! You do not eat at McDonalds but most folks do. You are a dinosaur, snooty to say the least. Alot of folks,will enjoy this new sony camera, just like an old 110 kodak, or a good old polaroid. Snooty pros will not, they need to feel self important with high dollar gear, and eclectic technique, but most of us dummies will enjoy a good snapshot of our friends while enjoying a quarter pounder wih cheese. I will go to my grave being fat dumb and happy enjoying simple snapshots and greasy burgers, you will go to your grave in pristine athletic shape, enjoying art gallery quality professionallly lit portraits, while eating tofu. We will all go to our graves, I am having much more fun! Rock on, cheap sony for the everyman!!! Oh geez, this is turning ugly. Mc Donald's is freaking killing you folks, and I don't find Kirk's attitude snotty in the least, he was pretty open minded about the A3000 at first (which I wasn't, I hated it on paper) but handled it and saw how crappy it is. People keep touting the low price tag, but cheap is already too expensive if it's bad to the point of being hardly usable (which this thing will be from the LCD/EVF point of view). My grand-ma always said "I'm not rich enough to afford cheap". I found times and again how right she was when trying to save on a tool, and ending up buying the proper/expensive tool in the end after dumping the crap/cheap one, I would have saved a bunch by going to the quality product to start with ! There's nothing snobbish here, and neither there is to be puzzled folks still eat at Mc Donald's. Yup we'll all go to our graves but in the meanwhile I'd rather workout and have better health. I live in France and indulge in a bunch of fine dining, trust me, I don't miss McDonald's one bit. for $400, one could buy better spec'd cameras that any type of user could handle. people are correct that there is a sense that Sony is misleading consumers with this product. so I can't see why you can even justify such equipment that is practically poorly made. To Tom: I read your (hopefully) tongue in cheek defense of being fat, stupid, satisfied with using inferior equipment to make crappy snapshots and the idea that all of this is making you so much happier than you think I might be. And I laughed. If you meant it in a serious vein then I am sorry for you. To be fat and slow and carry around excess baggage and to eat foods that will impede your ability to move around, to have satisfying intimate relations, etc. is hardly my idea of joyous fun. Fun is being able to fully engage and fully enjoy life. If you think most folks regularly eat at McDonalds or other fast food restaurants you are living in a completely different world than I am. If you think that most people want to be fat, stupid and have shorter, nastier lives then you are out of touch with the aspirations of an entire segment of our society. Photography was not always a shallow, blue collar undertaking. Back screen no good; well, you do not really use that when you doing film and you do not share using that when you use iphone etc. That is fine. As cheap as they is ok.
As evident from Nikon 1 series, it should be cheap to make it silence. With it silence and a better peering hole, it is ok as the sensor should be adequate. Kirk, I'm so glad you hated the camera, because I hated the very IDEA of it from the moment it was rumoured (then very quickly announced). To me, not only is it a P.O.S., it's also a dishonest one. Let's look at SOny's motive here for a minute : we all know that mirrorless cameras in RF form factor (a.k.a. "soap bar") don't do well in the USA, not that great in Europe, and are only rather well received in Asia. So Sony just put a DSLR shaped plastic case around a NEX based camera (same menu, most likely similar sensor, probably same AF performance I fear), along with the crappiest/cheapest/worst EVF/LCD combination they could find (and no auto switch between the two, mind you !) and pried it really low. Obvious goal : to have a Sony model back on the shelf at Best Buy or Costco right beside the CaNikon entry model DSLRs. Unknowning customers will see a D3200, 1100D and A3000 lined up together, and the SOny will be cheapest by far, and cute as a button. Moms and pops will buy it thinking they are getting DSLR performance (some may even have lens selection in mind for a potential prime or tele option) and be severely CHEATED. The 230K LCD (from the A37 which I quickly owned, and immediately ditched due to said screen) is godawful, and apparently the EVF is also crud. AF performance will *not* do well for indoor sports (or sports at all for that matter, and that includes any runner toddler) and lens selection is... well, we're getting more and more E mount lenses, but are still missing all the important ones. So yes, I do believe this camera is crap, and unfair to customers on top. This is pretty much what I was going to say, so I'll keep it short. Said shopper at Best Buy will not know that the A3000 is not really an SLR. Nor will he/she understand or appreciate the difference in AF speed between the A3000 and, say, a D3200 -- it may not be obvious when pointing the camera at objects in the store. If our customer is young, he may never have used a camera with a viewfinder, so probably won't spend much time looking in the viewfinders of the A3000 or D3200. So from the customer's point of view, it will probably boil down to a trade-off between the extra 8 MP of the D3200 vs. $150 cheaper for the A3000. Depending on your point of view, Sony is either showing some devilishly clever marketing, or being shamefully dishonest, or both. However, I suggest that if the average A3000 buyer is moving up from a point-and-shoot with a much smaller sensor, then he/she may not be disappointed. Image quality will improve, and AF performance may also be better than what that person has been accustomed to. And, she'll have a "DSLR" to impress people with. Kirk, Imagine the camera you held with the shutter of a NEX-7, a revamped 32mp sensor, phase contrast AF, a 4mp OLED EVF. Sony A3000 EVF: 200000 pixels. Leica C EVF: 200000 pixels. I've been slightly confused by the media coverage of the A3000, as if it is reaching some previously unheard specification and price point. Here in the UK the pre-order price is around £349. Sony already make the Alpha A58, a camaera with the same sensor, a nice EVF and screen, that accepts A mount rather than E mount lenses. Granted, it is probably a little larger than the new A3000 - but it retails for about £350. 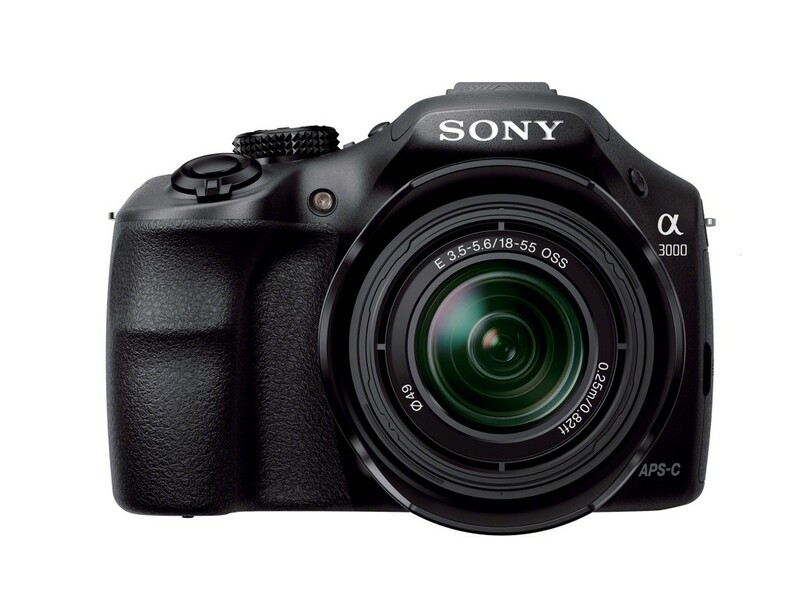 Obviously, the A3000 price will fall, but with such a lowly spec in some areas such as the EVF, I am left wondering what the point of the camera actually is - what need it is filling that Sony don't already have a product for? Of coruse, they have been on a mision to reduce the material cost of their product lines (witness the A58 that replaced the A57 - same retail price, lower material quality) or maintain a price/profit position on others, but I am still left confused by this. On August 30th you wrote: "I laughed when they suggested that no reasonable photographer would want one as I placed my pre-order on Amazon." Are you still buying one of these after your hands-on at the trade show? Thanks for asking. Pre-order cancelled. You didn't comment on how cheap and how low quality the plastic body feels. I also didn't comment on the taste of instant coffee or light pollution. I have often wondered why Sony chooses such odd compromises. The 'Best Buy' scenario seems like the most likely guess. Let's say you were in Best Buy and you came across an A58 and an A3000. The A58 is $29 more, but you get a bigger VF, faster AF, better lenses, IBIS, flip out screen, and so on. The only advantage of the A3000 is that if you take the lens off, (which you won't), then it would be about 1/3 smaller. I understand the advantage of smaller cameras, but it is like removing the doors to make your car smaller. It might weigh less, but you wouldn't want to drive the thing. I also understand the (potential) advantage of doing away with the fixed mirror. Sony has been working with Olympus to develop next-generation AF performance. But then they released a camera without it. I don't get it. I disagree with the naysayers. People who read Kirk Tuck are no where near the target market for this camera. Sony is aiming for the point and shoot users, and responding with the cheapest Nex ever. Isn't this a better option than the typical Powershot or Coolpix model? Remember, that $399.00 price is list. What will it sell for during the Christmas season? I expect that it feels cheap. I have used low res viewfinders and evfs, and don't like either. But maybe this is the new low end camera market, where you don't upgrade so much as you throw out the old broken one. For the rare buyer (A future Kirk Tuck reader) you a have removable lens camera with an APS sized sensor, even a hot shoe. Some options for the future, so to speak. The camera market is a tough place right now. I see the A3000 as a good attempt to underprice the DSLR market, and offer much better image quality than any point and shoot. It's not really an Alpha, it's a Cybershot. there are better cameras out there for the price compared to this. Why would anyone want to get this when Canon T3 kit is only $329 on Walmart. I'm interested in this camera as a digicamera for my old minolta md-lenses(with the adapter of course). Now I'm concerned that the evf is so bad, I can't adjust the focus correctly. I've used the NEX5 for my MD and MC-lenses, but I miss all too often a ovf/evf. Shall I ditch this one and hope for a reasonly cheap and better follower? A wise person once said to me that people always buy the middle option. For there to be a middle, you need a high and a low. This is the low. In other words, I suspect this camera was designed by the salesforce, not by a photographer. You're absolutely right about this camera. First time I looked at it, I hated it. Terrible control layout, and that was before seeing anything on it turned on. It's abominable. The shutter sounds bad, I've seen better EVFs in compact cameras from 14 years ago. I bought one anyway, even though I have far better cameras for the photographer's end. Its saving grace is really good technical quality at a low cost. I bought it to use as an APS-C mirrorless platform with focus peaking so I can use a focal reducer and legacy lenses and basically have a full frame camera. And I only spent $150 new, rather than full price. I've tried out the focus peaking, and that combined with magnified view as needed. I'll probably get something better than this toy if I decide I like this route for using my legacy lenses. We'll see. I like that it can charge over micro USB. Still have my MFT gear for when I actually care about what I'm doing. Pano-Mania. Going extra wide for fun. I went to the remnants of the Berlin Wall.